Anyway, this wonderful video is about the new film called “Loving Vincent”! It is about six minutes long, but worth the watch! It is several minutes long, but if you have any interest in Vincent van Gogh, his art, film making or animation, you will love this! I am so hoping I will be able to see it someday…somehow! First, I want to thank all of you who support me emotionally in my writing and art. I appreciate it more than you could ever know. I enjoy bringing a smile, a laugh or even tears to you. This is another long post and a little you may know already…but this is where I’m at. I have been going through a lot of emotional upheaval in the last few months – losing my brother to suicide, trying to figure out exactly what I want to spend the rest of my life doing, and both of our kids leaving the nest temporarily (tomorrow.) Our son is gone during the week living and working with friends, but he likes to come home some weekends to spend time with us. He will be going out on an 8-day trip with his crew from the California Conservation Corps. Also, our daughter is going to visit a friend for a while, possibly the rest of the summer! Last week I did both which I will continue a few more times. I do not feel at this point that I am going to need to go to either for a really long time. I have been in a good place mentally for quite some time now since recovering from some significant losses three years ago. What is really great is that my counselor can see me in the hour before my meeting starts on those two Mondays every month. Also, I met some great women at this meeting that I want to get to know. I am not alone – suicide has touched almost every family. Survivors feel angry, sad, abandoned, and wish we could have said or done something to prevent it. We feel guilty to some degree that we couldn’t stop it or didn’t see the signs. Some people find their loved ones who died. I can only imagine how emotionally traumatic that would be to a person. Just hearing how my brother killed himself and hearing how people did CPR on him for at least 20 minutes, puts images in my mind that I will never forget. Finding out that his best friend had brought my brother a wheelchair the day he died and didn’t see the signs of suicidal thoughts in him, helped me understand why my brother may have made this choice. When he called me a few weeks before he chose to die, the last thing he told me was that his legs didn’t work anymore. He said he could barely stand up or walk. I always knew that my brother was a prideful man. He never wanted to show weakness. He was always sensitive, loved animals (whom he knew could love him back,) and I think he just felt out of place his whole life. He was not a follower nor was he a leader. He was determined to go his own way which he always did. He didn’t confide in me or anyone else in our family about anything. I can relate to some of this. I have felt this way for most of my life. Some may think I am projecting part of who I am onto my brother. However, I would disagree. He and I were a lot alike in many ways that I just never really thought about until now. I will always miss him even though he never did let me get close to him. For some reason I’ll never know, things were just always intense between us. The difference between us, though, is that I hit bottom at 27 years old, reached out for help, and eventually began taking medications for depression and anxiety. My brother self-medicated from his teen years on, what I believe, was some type of mental illness. Thinking back over a lot of his behavior – his anger, impulsiveness, pride – makes me wonder if he had extreme anxiety which is why he drank. Alcohol is a depressant, though, and he was not one to sit around feeling depressed, which is why I think he became addicted to speed. All of this stuff can really mess up a person’s brain which just complicates mental health issues even more. It is a vicious cycle! The saddest part of all of this for me is that about three years ago he called me to apologize for how he had treated me most of our lives and tell me he didn’t deserve forgiveness; he said he wanted to quit the drugs but couldn’t. He felt stuck, scared, and defeated. I think he just had not hit bottom yet – until he saw that wheelchair. Unfortunately, hitting bottom for him didn’t mean reaching out for help. I believe he may have thoughts like: “I am not going to become an invalid.” “I will not become helpless.” “I will not become dependent on anyone to help me with everyday things I can no longer do for myself.” I knew my brother well enough to know that this is very close to what had to be going through his mind that last day. No one will ever love the real me. How can anyone love me when I am such an emotional mess? If you or someone you know is struggling with suicidal thoughts, do what could be the hardest things you may ever do – pick up the phone and call your local suicide hotline or the Suicide Prevention Services of America at 1-800-273-8225. Lastly, please do not allow yourself or anyone you know to stay isolated. Try your best to reach out. How does the creative process work? Like a flying jewel, the hummingbird darts lightly through the world, teaching us to appreciate the wonder and magic of every day existence………. Initially the seed of an idea is sewn. The seed then enters into an incubation period which can be short lived, or take years to come to fruition. The seed of an idea As we go about our daily lives, just like pieces of a jigsaw puzzle being revealed, the seed sprouts ideas that give us more information…..This can happen at any time. It’s vital to record these ideas, because even when we think we couldn’t possibly forget a moment of inspiration……we can, and do, which is why it’s important to always have a sketch/notebook at hand. MENTAL HEALTH: Getting Well is Possible. It was exciting for me to hear about all of the many services this group of people is going to offer to Shasta County. I knew then that God was showing me how my life is going to change real soon. I signed up to be a volunteer. I will start out doing simple things at first such as answering phones or e-mails or helping with mailings. I also plan to begin attending meetings facilitated by the woman I met with. She facilitates meetings for friends and family members of people who completed suicide. It has been many years since I went to any kind of open recovery meetings such as this, but I am looking forward to it. I remember back in 1988 when I went to my first recovery meetings after I stopped drinking and using drugs. I felt very nervous and afraid. However, I am not that person anymore; I know what I need to deal with, I have good boundaries, and there is no pressure to share. I think just meeting new people and hearing other people’s stories will help me begin to deal with the unfortunate choice my brother made. I will have no problem sharing or talking, though, so I am sure I will. The next meeting isn’t until June 5th so I have some time to process all of it some more before then. I have my first counseling meeting set up for June 2nd with a therapist I met a couple of months ago. I am also looking forward to talking with her. It has been a very long time since I went to a woman counselor which will be different. When I first went to counseling in 1988, I went to a woman. However, after several months, I felt really uncomfortable with her for some reason. So I stopped. I kept going to the ACA meetings, and then found a male counselor at the church I was attending at the time. I went to him for several years, and he was encouraging, safe, and the first man I ever felt connected with emotionally whom I knew I could trust. I grew a lot in those years, and he helped me through the transition of entering a second marriage which has been healthy and loving. My husband and I have been together since December of 1994. It has been quite a journey! And now we are looking toward the future when our nest is empty and he retires someday. It has been many years since I have taken any kind of classes, but I had already been thinking about something along these lines for the last year or so. I just had no idea I would find out about this wonderful care facility this way. So hopefully, as I said in my last post about my brother, something good will come from his death. It is possible that I may eventually get to use my writing and art to contribute to the creating of flyers, etc. So that is exciting for me, too. Thank you to all of you who read my last post about the suicide of my brother. I appreciate all of your support, prayers, and comments more than you know. I am planning on keeping you updated on what I will be doing and learning as a volunteer in the mental health community. I am still doing art and still plan to keep working on the picture books I’d like to write and illustrate, but for now it is just for fun. I am feeling like this other work is going to become more important to me for the time being, but the facility does also have a program where they train people to go into elementary schools and talk about suicide. Who knows? Maybe somehow, all of this will meld together into something beautiful. I sure hope so. SUICIDE: Don’t Make That Choice! On the morning of May 5th, I learned that one of my brothers committed suicide on May 4th. In a way, I wasn’t surprised when I thought back on the last time I had spoken with him. He called me out of the blue about a month before this and asked me if I knew where his daughter was. I thought this was a strange question since I have not seen her since she was three years old! She and her mom left California in the early ’80’s when her mom and my brother divorced. Anyway, I asked him why he needed to find her. I asked him if he was sick. He said he wasn’t sick, but he couldn’t hardly walk anymore. He said he wanted her to be able to have all of his part of the financial investments that our parents left us “just in case something happens to me.” In the back of my mind I had a flash of what he may have been planning. However, I did not ask him if he was feeling suicidal. I wish I had. I was actually surprised that he even called me. Hello Friends! Today I want to share a post from my husband’s new blog, CCC: Hard Corps. He has been finding all kinds of people who write about their experiences in the California Conservation Corps. either from the past or currently. Our son just joined them a month or so ago and is loving the great work they are doing. Our daughter will be joining sometime soon after she graduates from high school this year. My husband was in the CCC back in the late 1980’s. We met in 1990 after he had just gotten out. Agnes’s story is very inspiring! Enjoy! Recently I decided to look into the biography of Frida Kahlo, the female Mexican artist who definitely painted her pain. Above is my personal favorite picture of her. Most of her paintings have always felt a bit unsettling and disturbing to me. I never felt comfortable viewing them, but I think it was because I never researched her life to find out why she painted the things she did. I really didn’t know anything about her until I watched a Biography DVD about her that I checked out from the library a couple of weeks ago. It was then that I learned about the horrific bus accident she was in when she was just 18 years old. This accident changed her life in many ways. Frida Kahlo was born on July 6, 1907. Her full name was Magdelena Carmen Frieda Kahlo Calderon. She later changed the spelling of her first name to a less Germanic spelling. Her father was Wilhelm Kahlo, a “German-Jew of Hungarian descent who had come to Mexico as a young man.” He first worked in the jewelry trade which was his father’s business, then took up photography after marrying Matlde, his second wife. Then he changed his last name to Guillermo. Frida’s father was a positive influence in her life. When she was six, she was stricken with polio. Guillermo encouraged her to swim, participate in sports, ride a bike and keep herself physically active. However, her right leg remained disfigured and much thinner than her left for the rest of her life. She mostly wore long skirts and long pants to hide it. 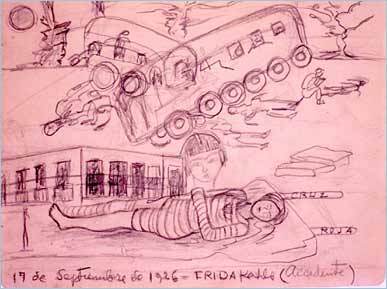 When Frida was 15, she was admitted to the Prepa, or National Preparatory School. She changed her birth year to 1910 and claimed to be 12 instead. It is believed she did this because she wanted to be more closely associated with the Mexican Revolution which began that year. September 17, 1926, was the day that changed her life forever. Frida had been shopping with her friend Alejandro Arias. As they were walking along they decided to catch a bus that had benches along the sides for people to sit on. As the bus driver tried to pass in front of a turning streetcar, they crashed and Frida was thrown from the bus. Alejandro found her lying in the street with the rod of a metal handrail impaling her left hip and exiting through her female organs. She also suffered several fractures in her third and fourth vertebrae, pelvis, and right foot. Her left elbow was dislocated and the rod also caused a deep abdominal wound. She spent a month in the hospital and never went back to school. After she went home she was confined to bed for much of her recovery. It was at this time that her mother gave her a small lap easel to use for painting. 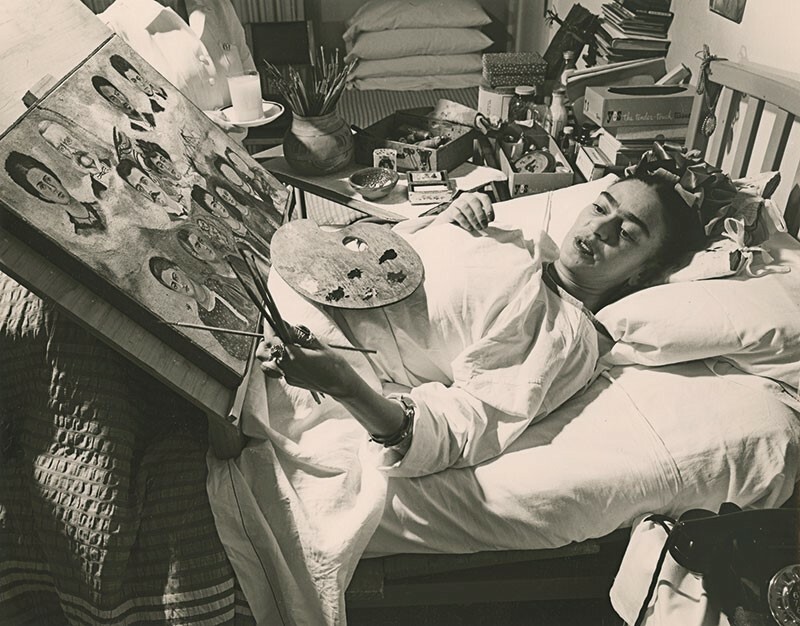 So Frida put a mirror in the canopy of her bed and began painting her self-portraits and still lifes. When she was able to get up more, she also began to paint larger portraits of people she knew. 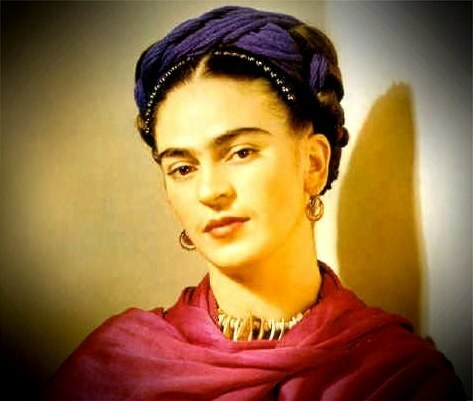 Frida suffered through many operations, several body casts, and a great deal of mental as physical anguish. Her friend Alejandro went away to Europe for two years and they wrote to each other, and he visited sometimes, but their relationship was not meant to become anything more. Frida fell in love with and married Diego Rivera on August 21, 1929, a famous, overweight, middle-aged artist, when she was just 19. She relished the attention she received in being his wife. They had a rocky marriage and both had affairs; the most devastating one for Frida was when Diego had an affair with her sister, Christina. Diego and Frida divorced in 1939, but were remarried a little over a year later and stayed married until her death on July 13, 1954. She painted over 150 paintings in her lifetime but only had one individual exhibition. It was held from April 13 to 27, 1953, in Mexico at the Galeria de Arte Contemporaneo. She had also suffered through many more operations in prior years in attempts to fix her spine and leg which had both been so badly damaged in the bus accident, but the last operation she had was in 1953 when her right leg was amputated below the knee because of gangrene. There is so much more to know about Frida Kahlo, but I don’t want this post to be too long. If you would like to know any more about her life and paintings, you can read more about her here: http://www.fridakahlofans.com/biocomplete.html. I also would recommend the book “Frida Kahlo, The Brush of Anguish” by Martha Zamora, which is the source I used for this post and where the quote in the second paragraph came from. I found the pictures on Google. I have often thought about trying to paint about some of the painful things I have gone through in my life, but then when I sit down to paint, I find I would rather paint beauty, because focusing on flowers, landscapes or beautiful sea creatures is what has helped me through the last few years. I appreciate everyone who loves the sea turtles I have painted. I am currently working on doing illustrations for a children’s story I wrote quite a while back (not Larry, the Lonely Leatherback, but a different one.) I have been trying to get the characters to look the way I have them pictured in my mind, but sometimes it is difficult to figure out how to draw them in certain poses! However, it is a challenge, which is what I love and keeps me going.